One interesting aspect of nineteenth-century medicine is the fact that many clinicians were convinced that every ailment could be traced ultimately to the same cause. Some were sure that most illnesses were triggered by problems with the liver; others that a disordered digestion could manifest in symptoms all over the body. Towards the end of the century, French physicians became obsessed with the nervous system, believing that everything from heart disease to metabolic disorders was in essence a ‘nervous’ condition. It may be assumed as a fact, that there is no branch of the healing art, so little founded on scientific principles as that of Dental Surgery. I do not hesitate in the least to assert it as my sincere opinion that Dental Surgery, in the manner in which it is practised at present, is really a great positive evil. Mrs. S , was requested by Mr. Lawrence, in March 1840, to consult me about her teeth, giving it as his opinion that her sufferings were principally produced by the diseased condition of her mouth. The patient was 69 years of age, and although delicate and nervous, did not particularly suffer in her general health, but for the last ten or twelve years had been gradually losing her sight, so that she had for some years required a constant guide, and had now become almost totally blind. Dr Koecker does not attempt to explain how tooth decay might result in blindness. On a minute examination I found her mouth in a most diseased and disgusting condition. The gums were much swollen, of a red and livid appearance, and, together with the alveolar processes, in a state of much inflammation and suppuration. The alveolar process is the ridge of bone which contains the tooth sockets. Seven or eight dead roots and stumps were remaining in different parts of both the upper and under jaws, intermixed with 11 apparently healthy teeth, to which latter were fastened in different places four small sets of artificial teeth, of one to four teeth each, mounted on gold, and both constructed and inserted in the most injudicious and unskilful manner, so that some of the teeth, to which the sets were attached, had now become denuded of the gums and had been retained, probably for years, in their positions only by the gold fastenings of the artificial teeth. The artificial teeth had not been removed from their places for six or seven years, and had become, along with the natural teeth and roots, incrusted with a mass of tartar to such an extent that it was difficult to distinguish the one from the other. It sounds pretty disgusting. Horsehair toothbrushes were in use at this date, but I suspect this patient did not even employ this basic measure. Some of the roots and teeth were still retained firmly in their sockets, but the greater part were very loose In order to obtain a precise view of the case, it was necessary first to remove all the sets of artificial teeth, which proved to be a difficult task; I was obliged to scale off in the most careful manner the greater part of the incrusting tartar before I could accomplish this. Having succeeded however in doing so, I found it unavoidably necessary to extract every remaining root and tooth, not one of them being in such a state as to render the preservation possible. The unpleasantness of this procedure can barely be imagined. 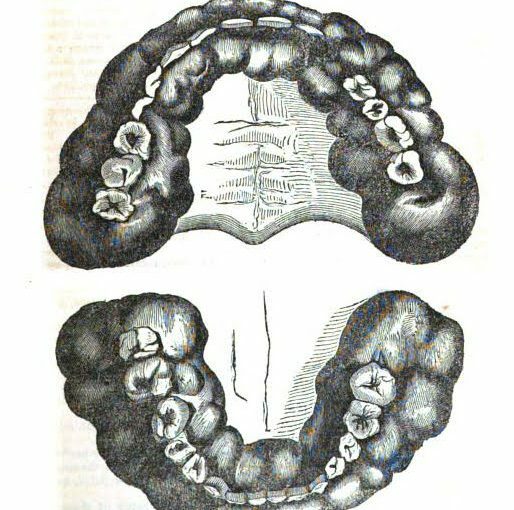 The dentist pulled eleven healthy teeth, and then had to carve out the roots of another eight – all in an age before anaesthetics. After the restoration of perfect health to every part of the mouth, the lady was provided with a properly-constructed set of artificial teeth, which fulfilled every desired effect; and I am happy to state that she has gradually so far recovered her sight that she requires no guide, and her general health has ever since so much improved, that now, at the age of seventy, she enjoys better health than for the last ten years. Good for her. But somehow I doubt that her teeth had anything to do with it. Because of the close proximity of the areas that were infected to her vision centers, there could have very well been an extensive infection causing swelling and blindness. Dental infections can cause an amazing array of unusual symptoms. As a registered nurse I’ve seen hearing and taste loss, along with heart damage caused by oral infections. I’m a veterinary assistant. Because cats do not generally have routine dental care, it’s not uncommon for teeth to be covered in tartar above the gum line and completely rotten below, with the tartar being the only thing holding them in place. This description sounds like pretty much the same thing, and teeth in that condition are actually relatively easy to remove, though I still wouldn’t want to have it done without anesthesia.